Any pics or news of Kimi's snowmobile adventure? Finnish MTV3 reported yesterday that Kimi will contest in a snowmobile race in Saalbach-Hinterglem, Austria on December 8, along with Nico Hulkenberg. No updates though. I've been there at Christmas time and there were lots and lots of snow already then. It's also beautiful in the summer, so depends what you're looking for. I have a question. Kimi finished 2003 season in 2nd place. His teammate Coulthard finished 7th. Mclaren were 3rd in the WCC so the drivers got the numbers 5 and 6 for next year. In 2004, why was number 5 given for Coulthard and number 6 for Kimi despite Kimi finishing ahead of Coulthard? More interesting financial news regarding Lotus.. I saw this in the other forum a few days ago. One person has tweeted this, it could easily be made up. Anyone can make an F1 themed twitter name and tweet anything they want. Looks like? Based on what does it look like that? due to luck??? he is the racer of them them all. My "Leave me alone, I know what I'm doing" T-shirt, hoodie and beanie arrived today, wohoo! They are replicas of the T-shirt "Kimi" gave to the team, pretty cool Of course he only gave T-shirts, but the hoodie and beanie has the same theme. Kimi Raikkonen says Lotus is more about racing than politics compared to some of the other teams he has driven for. "I always said that this is a bit of a different team to the others that I raced for before," the ex-McLaren and Ferrari driver said. "It's all about racing and less about politics and I think that's a good thing for the whole team." "It's been okay [this year], but then for sure you want to do it even better," he said. "When you start doing a few good results you expect to do even better, but it's not been easy and we've been quite consistent - not strong always - but we've been consistent and that kept us in the championship for a long time and brought us many points. He added: "I know the business itself of Formula One, but it's just being with a new team and finding what you want from the car and it should be a bit more easy next year. There are a lot things that can change and we have to build first a good car to be able to fight for the title. I put Nicoles translation to Valtteri thread but its maybe the explanation why Kimi didnt end up at Williams..
Is Kimi not going to go to the awards ceremony this week?, I know he said that he hoped he would lose 3rd in the WDC just so that he would not have to attend! Does not care unless he gets the most important award of all which would have been the WDC. Its this Friday, I don't think it's compulsory for him to attend I know what I would rather go to! Valtteri Bottas F1-contract was announced in the end of November. Commercial Counsellor Antti Aarnio-Wihuri and Sir Frank Williams had however talked through the schemes already last summer. – Frank and I met in August and basically agreed upon that this is what we aim for. In the end everything went just like we had planned. I had known for a longer time that Valtteri gets the seat as a racing driver. But we agreed that we will not talk about this and that's exactly how we acted, Aarnio-Wihuri said to Urheilutieto. Aarnio-Wihuri has known Frank Williams for 30 years already. They met during Aarnio-Wihuri's own racing career. As a young man he raced both in track-racing and rally and he also owned his own racing team in motorsport in the 70's. It's quite a circle in Finnish motorsport that closes due to Bottas' F1-seat. The times are completely different now, but the personal connections that Antti Aarnio-Wihuri made decades ago are still valid. Motorsport is still close to his heart. His company Wihuri Oy has supported Bottas' rise to F1 for many years already. – We made the plan about going for Valtteri's F1-seat ten years ago already, so of course it's a positive thing that it finally succeeded. It's never granted that these things pull off. – What made his seat possible was that Valtteri knows how to race, but also the fact that we have invested a lot of money in him. In addition to that I have a personal relationship with Frank Williams. That was also significant, Aarnio-Wihuri says. – Our big ads appear on Williams-team's car next year so that they are visible in television. On top of that we have different by-products that are related to the races and also bring visibility. We have factories in Europe and USA. We invest though F1-sponsoring to get visibility in the countries where we have operation, Aarnio-Wihuri said. The company also put cold money in the game so that Bottas got the racing seat. – We are talking about substantial amounts but not about tens of millions like some other drivers are said to bring in. We hope that we get back the money we invested through advertising. – Other Finnish companies should start to sponsor young driver-talents but they should choose the target they sponsor very carefully. Everyone's driving talents and especially mental characteristics are not enough for a F1-seat. This project succeeded brilliantly because we proceeded with a long-term plan. Other Finnish companies who sponsor Bottas are Kemppi and Laulumaa. Hi Kiminatics! Here is Nicole's translation of Heikki Kulta's fans' Q&A with Kimi. Enjoy! It took it's own time to get Kimi Räikkönen's interview in the season's final race and it took even more time to get this blog published. Because questions came both in Finnish and in English from all over the world, I aim to take both equally in consideration. There were lots of good questions. A bunch of good ones remained unasked due to the limited time I had at my disposal - which was doubled in the end - during the qualification-evening. 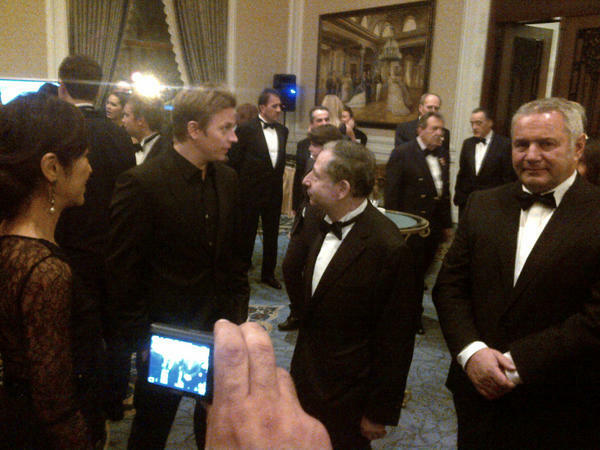 Kimi clearly fired up over some different questions. The season is over but the new one begins before one has properly recovered from this one. I hope that each and everyone finds something they like from this Q&A - cluster. Please comment freely if the answers awaken opinions. Kimi Räikkönen is known as the fairest wheel-to-wheel fighter in F1-circles. He is very tough in each confrontation, but careful. He very rarely crashes. How important is the reputation of being a fair driver to Räikkönen himself? – Well it's always better than having a reputation of crashing in every race, Räikkönen laughs. Well, now it's my turn. Thanks for the translations guys! I do have one question though... What on earth is a "fipple fluit" ?? "I was in a baby carriage and my bro pushed them into some sand and in the sudden stop a broken fipple fluit jabbed a hole in my throat." haha I need to ask Nicole! Get back to you later unless some other Finns here can help! According to Wander from Autosport, it is a broken flute! The dude on the left looks like a groupie meeting her idol. Kimi's cool as chocolate fudge cake though. look how relaxed he is next too Jean. Ice! 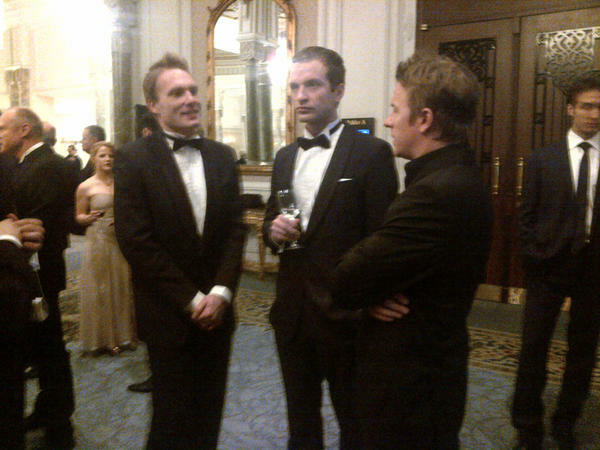 Kimi: hmm, if i go on talking, maybe he will gherkin in his pants.